The group I was with enjoyed our stay at Bule Homestay. The staff were extremely helpful and gave us great input on beaches to check out. It was amazing how accommodating they were. We requested 4 motorbikes and they were able to give them to us within 20 minutes! I would highly recommend staying here as it is affordable, clean, and they have a warm and welcoming staff. Also, TRY to mushroom soup with the chicken (probably some of the best soup I had during the entire trip!). I like the place very much. I guess it is still new. The room is spacious, clean and tidy. It is well maintained. The break fast is great too, especially the banana pancake with honey. The hotel compound is very well kept and quiet. The only thing is, the location is about 3KM from Kuta Beach. But the hotel provide motor bike for rental at Rupiah 50,000 per day. So still can go anywhere you want with the bike. Friendly people, clean rooms and gardens, great accomodation. The rooms are chalet type all facing the gardens, about 10 rooms in all, The rooms are new, well designed, and tastefully furnished, everything worked, hot shower, Flat screen TV and Cable, quiet a/c, fan if you prefer, Gardens, lawns, coy pond , rockery all beautifully put together and well kept. Wifi is slow. Owner and staff so nice, after Bluebird taxi let us down at the last minute, the owner drove us to the airport at 4am to catch a 6am flight, and was happy to help us. The only drawback is that you really neeed your own transport, hire a motorbike or something, there is nothing within walking distance. This place is on my list of places to go back to. Everything is clean, the food is good, nice host, motorbikes were very safe. A lit bit far from the center and the beach but you need a scooter to go to the best beach anyway. very clean and spacious room. little far from the beach, but you will rent a motor bike anyway, so not a big concern it has air conditioner but i don't think it really works. Cold(not hot) water shower. we had a wonderful stay at bule. it's a not very far from kuta town and the other bars and restaurants. you can and probably should rent a scooter at the homestay. we got a brand new scooter for a good price. the room was really spacious and very clean. the staff was friendly, welcoming and helpful in every way. the property looks like in the pictures. you'll hear a little traffic and the mosque, but this is usual for kuta and a lot quieter than in the town centre. we would have extended our stay but it was fully booked. the WIFI was stable and fast. breakfast was good too. Nice, clean, and big room. we arrived at late night, and so tired to get dinner outside the hotel. so we decide to order dinner from this hotel. and surprisingly the java fried rice is delicious! the staff is also very nice and helpful ! you can rent a motorbike directly from this hotel to explore kuta. + we liked this homestay, because the staffs were really friendly. The room, bed was big and comfortable. We booked for 2 nights but we stayed one more night . - Internet was so slow. Only cold water for shower. I can really recommend staying at Bule. It is located a little bit outside of Kuta, but you need motorcycles anyway and you can rent them for a very good price at the homestay. Chicco was one of the nicest guys I met during my whole travel. Breakfast always comes with delicious fresh fruits. The accommodation, was also the nicest I have stayed in for a comparable price span. They are extending the property at the moment, so it will get even better. 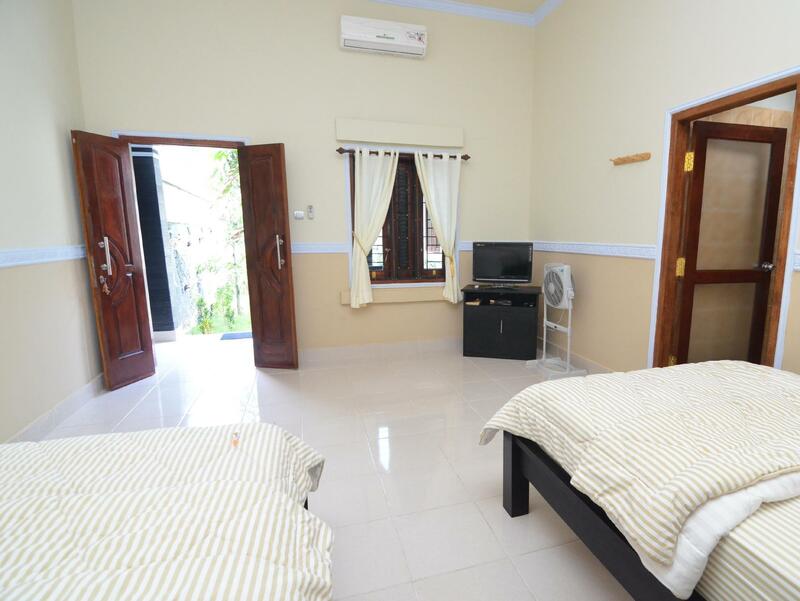 If you want to have a very nice homestay with a good atmosphere, theres no other way than to book Bule! Cosy place to stay, feeling of a home away from home. Chico, the guy who runs the show is friendly and helpful. Breakfast is simple but portions are huge and food is tasty. In 5 minutes of motor bike you get to kuta center and in about 20 to 30 minutes you can reach all the best hidden beaches. Initially, my room had some problem (tv not working, toilet not flushing, no wardrobe, some light bulbs fused), but Chico promptly offered us another room which was perfect. I had very good sleeps. if you like tennis table you can play with staff and other guests, a way of getting together and making new friends. Overall it is definitely good value for money and I would recommend it.